Short Version: I burned the bootloader using the "ATtiny Modern" version of the "ATtiny841 (optiboot)" board with a 16MHz external crystal by using an Arduino Uno R3 as an ISP. After that, I went to upload my code (same settings) and it gave me an error saying "Device signature = 0x1e950f", which I think is for the ATmega328P based on what I've found on Google, and "Expected signature for ATtiny841 is 1E 93 15". When I burnt the bootloader, the output did say that the signature was 0x1e9315 so I'm not sure why it's different to upload code when none of the settings were changed. Anybody have any idea of what went wrong and how I can fix it? System wide configuration file is "C:\arduino-1.8.5\hardware\arduino-tiny-841-master\avr/avrdude.conf"
# ATtiny841 has Signature Bytes: 0x1E 0x93 0x0C. If you do upload with the optiboot board def selected, it tries to upload using the bootloader, so its talking to the bootloader on the arduino uno you were using as isp (which reports that its a 328p, causing avrdude to stop the process). If you want to use the bootloader, connect a serial adapter as described in the attinycore docs. Btw - are you still using the ATtiny Modern core, instead of the unified ATtinyCore? I combined them ages ago and have been adding new features and fixes to the combined version only, see link in my sig or github. 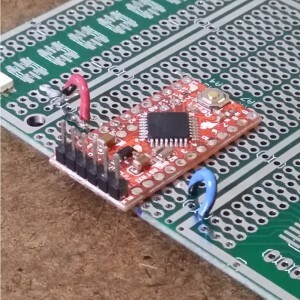 The biggest feature is probably the unified wire/spi libraries - you can now just use Wire.h and SPI.h and unmodified libraries for i2c/spi devices - you dont need special versions and libraries adapted for ATtiny parts. Everything is automagically handled for you by the special version of those libraries included with the core. Export compiled binary also outputs assembler listings now too. I'll see if that works. As for ATtinyCore, I'm using a school laptop and they blocked GitHub so I had to try to find a way around it by downloading the core from home. I think they just unblocked it on the computer's we filter but it's still blocked on the routers at school. When installing it, should I delete the old cores first or leave them and install the new one? *edit* It turns out that I did have the ATtinyCore installed and I was able to link it with the URL instead of manually installing it. I decided to delete both libraries and make sure the core was updated through the boards manager. Thanks for your help, I'll see if choosing no optiboot works on Monday because all of my equipment at school. I only have an ICSP header on the pcb so I can't use a serial interface. The school... which is trying to teach computer related things... has blocked github? I'm just speechless. Ok, new error... maybe because it isn't the most up to date? It has optiboot burned onto it and then I used the ATtiny841 (no optiboot). System wide configuration file is "C:\arduino-1.8.5\portable\packages\arduino\tools\avrdude\6.3.0-arduino9/etc/avrdude.conf"
avrdude: AVR Part "attiny841" not found. I thought that maybe because I have a portable version of Arduino IDE (I didn't have admin access when I installed arduino... I've since found a way around that but haven't needed to change Arduino so I left it) that the core was in the wrong location so I made a copy and put it in the C:\arduino-1.8.5\portable\packages folder but that didn't change anything. Use the programmer option that has the (ATTinyCore) after the name - there's a longstanding "feature" of the IDE that causes it to ignore the directives of a custom hardware package's platform.txt that direct the IDE to use the avrdude.conf file that the custom hardware package supplies when uploading sketches to the board when using an ISP programmer, if the selected programmer was not supplied by a custom hardware package. So it uses the default avrdude.conf which doesn't contain definitions for a large number of parts. ATTinyCore supplies a duplicate of the programmer definitions to work around this stupid behavior, these are named with (ATTinyCore) after the name of the programmer. Error compiling for board ATtiny441/841 (No bootloader). It happens on every sketch I try including new ones... I'm not sure why because it didn't used to do this. I read your read-me document in the downloaded core, really useful stuff... probably should have read that before . I'll downgrade my board version to 1.6.21 and see what happens. Do sketches for standard AVR-based Arduino boards compile successfully? That looks like the core.a file not found error, but that typically effects all boards, whether or not from a custom core (and is related, IIRC, to an overly-aggressive antivirus program interfering with the compilation process). Yeah, normal sketches compile and I'm able to upload them to other microcontrollers. The error only comes when attempting to upload to the 841. I'll try it on a home computer to see if it's something with the school's settings. So after literally a month of research and testing, I figured out that even though the original method described above wasn't working due to some mysterious error... I was able to keep the '841 w/ optiboot' selected and use the hotkey CTRL+SHIFT+U for uploading with a programmer in order to successfully upload a sketch. I didn't want to use an FTDI programmer because it is slower and I didn't have one on hand (plus all of my designs were based on the use of the ICSP header). Both methods of uploading a sketch are supposed to bypass the arduino as an ISP so that the computer thinks its talking directly to the ATtiny841 but obviously selecting w/o optiboot didn't want to work. Plus this is an easier method to. Thanks for your help on with this DrAzzy even though half my questions were literally in your "ReadMe" document . You *really* shouldn't have to do that. So with everything the same as your working setup, but ATtiny841 (no bootloader) selected, upload gives the part not found error still? What programmer option are you using? Is it one with (ATTinyCore) after the name? Try using Upload Using Programmer with ATtiny841 (no bootloader) selected?